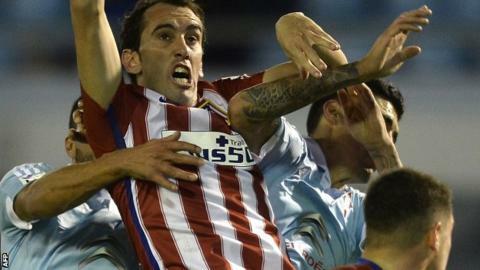 Atletico Madrid moved back to the top of La Liga with a comfortable win at a rainy Celta Vigo. Antoine Griezmann's 10th league goal of the season and a second-half strike from Yannick Carrasco gave Diego Simeone's side victory. They lead Barcelona, who beat Granada 4-0 on Saturday, by two points but have played a game more. The game went ahead despite torrential rain flooding a dressing room and roads around the ground two days earlier. Atletico travel to the Nou Camp to play Barcelona on 30 January. Griezmann put Atletico ahead three minutes into the second half with a neat, close-range finish after combining with Koke and Saul. They doubled their lead through substitute Carrasco, who capitalised on a poor Celta clearance to drill home. Antoine Griezmann celebrates after scoring his 10th La Liga goal of the season. Match ends, Celta de Vigo 0, Atlético de Madrid 2. Second Half ends, Celta de Vigo 0, Atlético de Madrid 2. Corner, Celta de Vigo. Conceded by Giménez. Foul by Cabral (Celta de Vigo). Jackson Martínez (Atlético de Madrid) wins a free kick in the attacking half. Foul by Señé (Celta de Vigo). Jesús Gámez (Atlético de Madrid) wins a free kick on the right wing. Substitution, Celta de Vigo. Señé replaces Theo Bongonda. Substitution, Atlético de Madrid. Jesús Gámez replaces Antoine Griezmann. Substitution, Celta de Vigo. Borja Fernández replaces Pablo Hernández. Goal! Celta de Vigo 0, Atlético de Madrid 2. Yannick Carrasco (Atlético de Madrid) left footed shot from the centre of the box to the top left corner. Assisted by Jackson Martínez. Daniel Wass (Celta de Vigo) wins a free kick in the attacking half. Substitution, Atlético de Madrid. Jackson Martínez replaces Luciano Vietto. Substitution, Celta de Vigo. Guidetti replaces Nemanja Radoja. Attempt blocked. Daniel Wass (Celta de Vigo) right footed shot from outside the box is blocked. Theo Bongonda (Celta de Vigo) wins a free kick in the attacking half. Nemanja Radoja (Celta de Vigo) is shown the yellow card for a bad foul. Foul by Nemanja Radoja (Celta de Vigo). Attempt blocked. Orellana (Celta de Vigo) right footed shot from the left side of the box is blocked. Pablo Hernández (Celta de Vigo) is shown the yellow card for a bad foul. Orellana (Celta de Vigo) wins a free kick in the defensive half. Attempt missed. Yannick Carrasco (Atlético de Madrid) right footed shot from outside the box is close, but misses the top left corner. Foul by Yannick Carrasco (Atlético de Madrid). Attempt missed. Daniel Wass (Celta de Vigo) right footed shot from outside the box is close, but misses to the right. Assisted by Iago Aspas. Corner, Atlético de Madrid. Conceded by Pablo Hernández. Corner, Atlético de Madrid. Conceded by Sergi Gómez. Saúl Ñíguez (Atlético de Madrid) wins a free kick on the left wing. Foul by Iago Aspas (Celta de Vigo).